Where’s everyone gone ? It’s very quiet around here . Did yis all fall out with each other or what ? Nah! When you stopped,, Dancer, there was this big empty hole. Dancer wrote: Where’s everyone gone ? It’s very quiet around here . Did yis all fall out with each other or what ? Hiya Dancer,long time no hear welcome back. Sinead wrote: Is there still a history of the building of the line to Greystones in the Station?? It was the last time I looked,must check again. bugrock wrote: Nah! When you stopped,, Dancer, there was this big empty hole. Somehow I doubt that Bugs but thanks anyway. Hope you are keeping well ? Holla wrote: Hiya Dancer,long time no hear welcome back. Hi Holla , thank you . Hope you are well ? Good to hear from you Dancer. I love that Portal picture of what the baths could have looked like. Looks authentic. Spent a lot of my childhood down there,it was a great facility at the time. Pity it was left to go to ruin. For me this painting is somewhat allegorical. 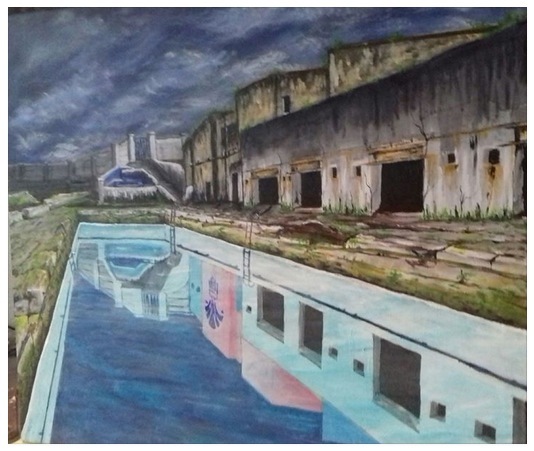 The painting shows the baths in it's current state of tumble down disrepair, but the reflection in the pool is the stylised baths in it's full former glory. A wonderful composition the present day decay and the former glory days of the Baths. I love it, very clever. I think the artist is personifying the spirit of the baths building.Thus, it could be an invocation of the elderly state peering longingly into a held memory reflection as it remembers itself and wishes to be young again? I like the clever portal picture but I have one reservation. The former glory alluded to in the pool reflection was not just about "good maintenance", in its heyday, it was also filled with people - a feature absent from the painting. My limited memories of the baths was of a place thronged with people of all ages. I say "limited" because I was of an age that led me to being banned by my mother for fear of catching polio. Reminds me of happy days at the baths -- now just a saddened derelict. Shame!! Spot on Gem, I guess that was the painters intention, reflection of the past in the pool, very clever as you said. Unfortunately I can't give the Artist credit because I took a screenshot a while back. Micheál wrote: The former glory alluded to in the pool reflection was not just about "good maintenance", in its heyday, it was also filled with people - a feature absent from the painting. I think was the intention, bleak, but there's something warming about the reflection. I get what you mean though, but how you portray people in that scene, a Ghost paddling, a "lifeguard" whacking me over the head for diving off the changing rooms wall again? I've sent Harjoe a few messages but no response for a while. If anybody is in contact he should be able to login now with the details I gave him. Hope he just didn't give up. Hi Strum ! I'll pass on that info to him ! Thank you. Micheál wrote: I like the clever portal picture but I have one reservation. I'd forgotten about the polio scare!! A friend of ours caught it and it shook us all. Remember the sugar lump. We queued outside the clinic in Blackrock to get it. Like everything else I think there was to be a follow up but we never got it, Gawd, you also have reminded me about the school doctor ....we were all lined up in our underware...not a pretty sight in the Liberty bodice days and the nicks to the knees days...and the doctor gave us the full monty. None of your ole PC or modesty or human rights in those days. I don't even think they informed our parents. Rocker wrote: I'd forgotten about the polio scare!! A friend of ours caught it and it shook us all. Remember the sugar lump. We queued outside the clinic in Blackrock to get it. Like everything else I think there was to be a follow up but we never got it, Gawd, you also have reminded me about the school doctor ....we were all lined up in our underware...not a pretty sight in the Liberty bodice days and the nicks to the knees days...and the doctor gave us the full monty. None of your ole PC or modesty or human rights in those days. I don't even think they informed our parents. I never heard of that Rocker. Was the Polio shot not one of our first vaccinations? another bit of useless info ..my mother always spoke of a scabies epidemic in the 30's and they were sent into Tara Street Baths stripped, painted with a whitewash mixture , dressed and sent home!! none of your ole modesty them days either. Everyone knew what you were walking with!! I messaged him Keeper. He should be good to go now. Folks, there's been a glitch in the registration process unbeknown to me until Harjoe couldn't log in, I even locked myself out trying to get his account working. Anyway Robert has changed a few things so Harjoe shouldn't have any problem now. I've messaged him but he's not on FB much so if anybody is in touch please let him know. Robert has also mentioned about upgrading the site to the newest software. The site will still look the same so I don't know if it's worth upgrading. He's checking a few things at the moment and will get back to me and I'll keep you posted.